Congratulations to Clare Haines and Melissa Burton from Lingerie Outlet Store, who correctly answered that H.E.Bates was the author of the book: "The Darling Buds of May", which starred a young David Jason as the lead in the hit TV series. Clare wins a meal for two at The Five Alls at Filkins near Lechlade. Imagine a warm lazy summer afternoon in the sunshine, enjoying a refreshing breeze beside a slow flowing river while you watch a couple of swans floating effortlessly downstream. Courtesy of our friends at Marks and Spencer, we will supply a luxury afternoon tea to turn this fantasy into reality! 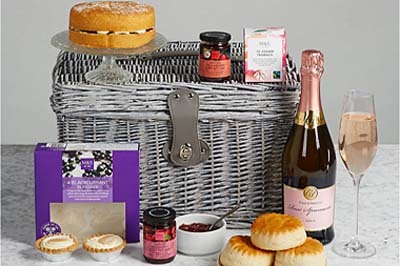 Win this luxury High Tea Hamper and enjoy the collection of scones, cakes, jam and tea, accompanied by a bottle of sparkling Casa d'Amello Rose Spumanteo and all presented in a beautiful deep lidded wicker basket. Name the Canadian band who recorded the song "Echo Beach" in 1979? Email your answer and contact details to jackie@jackiekerrrecruitment.com and the lucky winner will be drawn from the correct answers on Thursday 31st August 2017 - good luck!